Robert I. Aitken, a New York artist, designed the octagonal and round 1915-S Panama-Pacific International Exposition $50 pieces, both of which have the same design, except that unlike the round issue, the octagonal coins display dolphins in the angles on the obverse and reverse between the inscription and the points of the border. The obverse depicts Minerva, according to the official description "The Goddess of Wisdom, Skill, Contemplation, Spinning, Weaving and of Agriculture and Horticulture"-obviously, an all-around, ideal type of mythological person. The reverse, according to the original publicity, depicts an "owl, sacred to Minerva, the accepted symbol of wisdom, perched upon a branch of western pine." The dolphins in the angles of the octagonal piece were placed there, "suggesting as they encircle the central field, the uninterrupted water route made possible by the Panama Canal." Both varieties of coins bore the date as MCMXV, perhaps following the Roman numeral dating precedent set by Saint-Gaudens' beautiful $20 MCMVII of 1907. On January 23, 1915, Robert Aitken wrote to T. P. Dewey, acting director of the Mint, enclosing sketches of the obverse and reverse, noting that his design was to represent the Exposition theme of the products of wisdom and industry. The symbols of Minerva and the owl, "all full of beauty in themselves" express "the larger meaning of the Exposition, its appeal to the intellect." Daniel Chester French, chairman of the Commission of Fine Arts, was enthusiastic concerning Aitken's designs as well as those submitted by others for the lower denominations and recommended that the Treasury go ahead with the production. Concerning the original design for the $50 coin, Secretary of the Treasury William Gibbs McAdoo had the following to say: "The design of the $50 gold piece was	appropriate enough in the Greek coin from which it is evidently copied. The head of Pallas and the owl, sacred to her, conveyed some meaning on that coin, but none, so far as I can see, in the present instance, except as the head of Pallas may be identified with that of our own Goddess of Liberty. This spider-web is not accepted	today as a symbol of industry, if that was the artist's meaning, but the contrary; and the miniature dolphins floating in the air in front of Minerva's face seem to be very	inappropriate. So too, does the legend 'In God We Trust-1915' on the rim of Minerva's shield." Other critics jested by saying that the dolphin design suggested that the Panama Canal had been constructed for the convenience of these aquatic mammals. However, William Malburn, assistant secretary of the Treasury, was determined that all designs should be prepared by the Engraving Department at the Philadelphia Mint, undoubtedly a sentiment encouraged by Chief Engraver Charles E. Barber. Within the next month Barber was asked to furnish ideas for the $50 piece, but before much was done on this, Robert Aitken deleted the spider web from his early design and made a few other changes to the satisfaction of McAdoo. 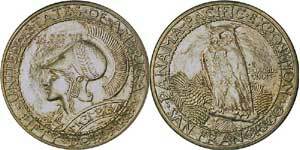 The 1916 volume of the American Journal of Numismatics reviewed the Panama-Pacific coins of the preceding year, noting that in creating the 50 pieces in round and octagonal form, "the artist had really two important American events to draw upon and a coin with an unusually large field in which to elaborate a composition. But the types of the coin reveal no American influence, the subjects being as appropriate for any other country and event as for California or the United States of America and the completion of the Panama Canal. The criticism often heard that 'there is nothing American about the coin except the inscription' is fully warranted, for the artist, instead of working out a specially American theme, drew from the vast armory of classical symbolism and presented a really fine Athena bust as typical of the industry, and a capital representation of Athena's owl as a symbol of the wisdom that built the canal. "So many have inveighed against the medalist's too frequent resort to the now commonplace classical symbolism-a weakness of which the art is happily working free-that to discuss the subject here would be running the risk of repeating what others have said. Without doubt classical subjects commend themselves as appropriate to the few of academic culture and taste, and yet the majority of people, and including, too, the majority of the cultivated, cannot but entertain the feeling that coins specially issued on the occasion celebrating one of the nation's greatest achievements should have borne types having a distinct reference to our national history and national spirit." The same reviewer went on to say that other pieces in the series deserved somewhat less criticism than the $50 pieces, and some of them no criticism at all. Art historian Cornelius Vermeule commented on the design in 1971:1 "Robert Aitken tried to create modern, pseudo-Athenian coins, in an idiom of archaeological classicism popular among many American sculptors trained partly at the American Academy in Rome before and after the First World War. His ideas were laudable. There were a minimum of inscriptions, classic Greco-Egyptian profile of Athena in full panoply, the date in Roman numerals, and a naturalistic owl in a mass of western pine cones. Dolphins fill the corners of the octagonals.... In an overall view, the arresting feature of the giant gold coins was their archaistic treatment of details and relief. Athena's crest, wreath, curls, and aegis imitate the work of an ancient bronze. The bead and reel between the outside rims comes from Greek architecture, and a form of the lettering around the rim recalls Roman sestertii of the Empire or papal medallions of the Cinquecento. These coins were a tour de force, dated to be sure, but unusual enough in all respects to be worthy of what American numismatic art could achieve when creativity and Mint technique worked in unison." Although the idea of having the $50 pieces coined at a site on the grounds of the Panama-Pacific International Exposition had been considered, this did not come to pass. On June 15, 1915, the first octagonal $50 pieces were struck in a special ceremony held at the San Francisco Mint in the venerable structure for which the cornerstone had been laid in 1870 and which was the only building in its area to survive the earthquake and fire in April 1906. Utilized was a large medal press that had been shipped for this purpose from the Philadelphia Mint. 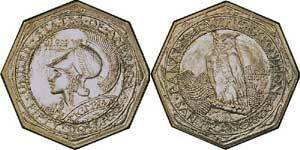 1,509 octagonal $50 pieces and 1,510 round versions were subsequently minted. Sales were not up to expectations, and after November 1916 a quantity amounting to 855 octagonal pieces went to the melting pot, leaving a net issuance of 645 pieces. Additionally, 1,015 examples of the round $50 were reduced to bullion, leaving a net issuance of just 483 pieces, a number which was to remain the lowest distribution quantity figure for any United States commemorative coin. On June 28, 1915, Farran Zerbe sent out the following notice to those who had ordered coins: "On account of the breaking of the dies for the round $50 piece and the closing of the Mint for end of fiscal year settlement, delivery of complete sets of commemorative coins and quantity lots of gold dollars will be delayed until about July 15. We can make immediate delivery of silver $.50, gold $2.50, and gold $50 octagonal. We regret the delay in filling your order, but the fault has not been ours, as nothing has been left undone by the Exposition to facilitate production. Your order is appreciated and we assure you it will go forward from our first supplies." The same announcement noted that "it is being arranged to deliver complete sets of these coins in form for preservation and public display-a single set showing one side, and a double set showing both obverse and reverse-with printed description of the artists' interpretation of the designs, all arranged in a velvet-covered tray and mounted under glass in a hammered metal frame ...."
"The coining of the first $50 gold piece was an event of considerable celebration and local interest at the San Francisco Mint. Representatives of the government, state, city, and Exposition, together with notable representatives of foreign governments, were present at the coining. In addition to the two shapes of the $50 gold pieces, there are included in this series one half dollar in silver and one dollar in gold and two-and-one-half dollars in gold. On the gold dollars appears an artist's ideal of Labor, this being the first time the sons of toil had been honored on the coinage of any nation. A complete set of these coins is now on public exhibition at the banking rooms of [space to be filled in by the local bank]. All are invited to see this set of interesting coins ...."
The octagonal $50 pieces were more popular than the round ones at the Exposition. More of these were sold singly and in boxed sets (containing the three lower denominations and the buyer's choice of one $50 variety), as it seemed to the typical buyer that the eight-sided coin was more distinctive in shape and a better reminder of the Gold Rush days than a round piece. The reception by numismatists of the Panama-Pacific coins was uniformly favorable, and undoubtedly at least a hundred or so five-piece sets were distributed in such channels, but most of the approximately 300 sets eventually sold seem to have gone to wealthy citizens in the San Francisco area, convention officials, bankers (particularly true of the framed sets sold later), and members of the general public. Farran Zerbe kept the Coin and Medal Department open through at least November 1916, at which time he tallied sales, determined how many coins of various denominations he should retain for later wholesaling as well as his own retail trade, and returned the balance to the Treasury to be converted to bullion. In later years the Panama-Pacific coins maintained their value, and soon thereafter began to increase. The $50 pieces in particular were highly desired, and within five years after the termination of original sales, a set containing all of the PanamaPacific coins, originally sold at $200, was valued in the $300 to $400 range. In keeping with the small quantities originally issued, 1915-S Panama-Pacific $50 gold coins are rare in all grades today, with the round pieces being slightly more elusive than the octagonal versions. The typical grade encountered is apt to be about MS-63 or MS-64 if the coin has been kept in an original box or frame or AU-58 to MS-63 if it has not. Many coins show rubbing on the cheek of Minerva, a telltale place to check when grading (see below). Probably 80% of the Panama-Pacific $50 coins originally distributed still exist today. About 300 five-piece sets (containing examples of both the round and octagonal $50), most of which were in glass-fronted copper frames, are believed to have been sold, and probably 80% to 90% survive. Of the half dozen or fewer double sets (with two of each coin variety, for a total of 10 coins) made, three or four are known. I have handled two and have seen one other double set. GRADING SUMMARY: The cheek of Minerva and her helmet are the checkpoints for friction and/or handling marks (usually just friction). The upper part of the owl is also a point to check. Avoid coins which have been cleaned or lightly polished (as evidenced by a myriad of microscopic hairlines). 1 Numismatic Art in America, p. 136. 2 Details of the ceremony and a list of the individuals who struck the first 29 pieces were published in The Numismatist, August 1915. 3 This is an inaccurate statement, as the United States Assay office of Gold issues struck in California in 1851 and 1852 were authorized government issues. 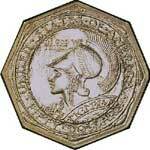 4 Not true; the 1851 and 1852 $50 pieces were octagonal. This article is from Commemorative Coins of the United States - A Complete Encyclopedia. To order a copy of this book for your library, click here. Q. David Bowers has been in the rare coin business since 1953 when he was a teenager. The author has served as president of the American Numismatic Association (1983-1985) and president of the Professional Numismatists Guild (1977-1979), is a recipient of the highest honor bestowed by the ANA (the Farran Zerbe Award), was the first ANA member to be named Numismatist of the Year (1995), has been inducted into the Numismatic Hall of Fame (at the ANA Headquarter in Colorado Springs), is a recipient of the highest honor bestowed by the Professional Numismatists Guild (The Founders' Award), and has received more "Book of the Year Award" and "Best Columnist" honors given by the Numismatic Literary Guild than any other writer. He has has written over 40 books, hundreds of auction and other catalogues, and several thousand articles.